First thing’s first – Happy New Year, one and all!! I trust by now you’re all back at work with a heart-full of resolutions to make the very most of 2017 (not least to follow the My Social Agency blog with renewed vigour). For many people, simply getting through 2016 alive seems like somewhat of a feat in itself. What a year it was for global politics, celebrity deaths and awful, awful music. 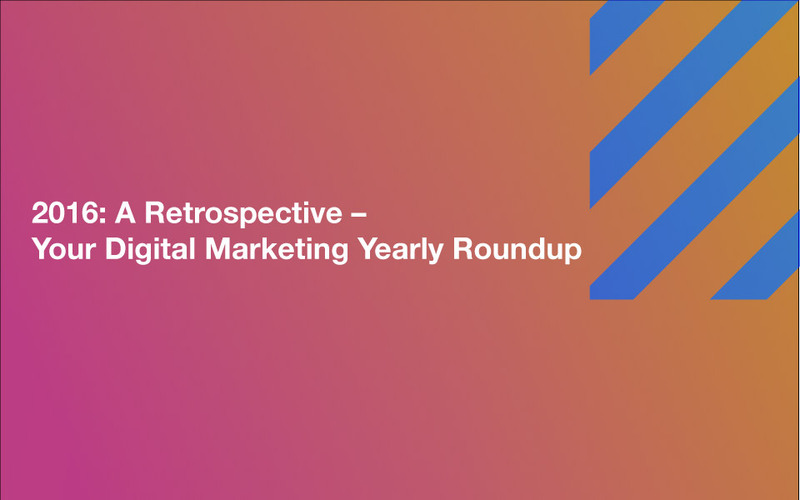 However, as distracting as all such chaos inevitably was, it has to be said that 2016 was the best year to date for digital marketers. It really was amazing. Since June, each week we have brought to you the news of a new set of updates to our most used and most beloved social networks – all of which meticulously designed to make digital marketing a whole lot more convenient, innovative, automated, and valuable for our respective businesses. It was like Christmas came every week! And so, to celebrate a fantastic year at the forefront of digital marketing innovation, we wanted our first blog of 2017 to take a look back at all the most important updates over the past 7 months. You may have missed a few, and we don’t want that – many of these updates were true game-changers in the digital marketing sphere, and if we really do want to get the most out of our efforts in 2017, then we first need to take a moment to make sure we’re equipped with all the tools that 2016 brought our way. Live video in particular was a big feature for 2016, as, throughout the year, platform upon platform – from Facebook to Twitter – started responding to the resounding success of Periscope and introducing their own versions of live streaming. But live video of course has its drawbacks – namely in the fact that not everyone to whom a business may want to broadcast can be reliably summoned to view a live video. But, in June 2016, Periscope responded to this, and enabled a permanent save feature for videos, marking the beginning of new expectations for all live video features across all platforms. Here we go – another important update for video marketers came in June in the form of YouTube Director. This was a cool new feature that presented a suite of new tools that enabled content creators to start producing high-quality, professionally designed video ads right from their smartphones. I did warn you – 2016 was massive for video marketing. And in July, a whole stream of new updates came our way. Facebook introduced the Creative Hub for advertisers, Tumblr launched live video, YouTube introduced live streaming on mobile, and Twitter extended the time of video tweets from 30 seconds to (a somewhat gimmicky) 140 seconds. This all happened in one week, by the way – read the full Roundup from July. Aside from video, there are of course countless other ways that social media can be and is used for marketing purposes. Facebook recognises this – in fact it positively adores it, for it is through advertising that it makes its billions. And so, to encourage businesses to make the most out of the platform as an advertising channel, Facebook for Business launched its first webinar series in an effort to teach marketers how to do Facebook marketing the right way. I can’t believe it was all the way back in August that Instagram first launched Instagram Stories. As marketers, we could now stitch together a series of images and videos that told a story. This was the first serious move of the year for Instagram in what appeared to be a strategy to attract Snapchat users. Indeed, the similarities of this new feature to what Snapchat already offered were remarkable. Here’s one piece of news from 2016 that it’s important not to miss – in August, the Federal Trade Commission (FTC) called for a clamp down on sponsored posts, namely with regards to advertisers who utilise influencers to promote their businesses. The FTC now calls for greater transparency from all organisations that pay for the services of influential figures to endorse their brands and products. Pinterest featured heavily in September with its introduction of Engagement Retargeting. Retargeting, of course, is an incredibly powerful conversion-driver across all aspects of digital marketing, and it was good to see Pinterest responding with this new feature. “There are people on Pinterest who are already excited about and interacting with your brand. Now, with engagement retargeting, you can use Pinterest to effectively target people who have shown interest in your brand by interacting with your Pins in a variety of ways. For example, if someone saved your after school snack ideas, you can retarget them in the future with birthday party treats,” Pinterest said. Perhaps it was in acknowledgement that Christmas campaigns would be starting to ramp up, but, whatever the reason, September was in a large way defined by updates to paid advertising features across at least 4 networks. Snapchat added 3 brand new ad targeting features, Facebook added one too, Link Ads were introduced to Facebook Messenger, and Instagram enhanced CTA Buttons and Video Links to the ads on its platform. Again, this all happened in one week – read the full Roundup from September. A sad, sad day for us all. Live video continued to play an important role as we moved coldly into autumn, with Periscope upping its game with the introduction of a VIP Program. By meeting certain sets of criteria, broadcasters would now be awarded Bronze, Silver and Gold statuses, that allowed them to enjoy even greater exposure and reach throughout the Periscope network. For me, this was one of the biggest and most significant updates of the year. Facebook Messenger had been slowly transforming from a simple IM into a fully-functional direct marketing channel, and when in October it was announced that Shopify was integrating its Direct Sales feature into Facebook’s Messenger app, it marked, for me at least, the true moment of change. Less than a month since Facebook Messenger began integrating Shopify (see above) into the platform and boom! – PayPal joins the fray, too. Take note everyone – in 2017, Facebook Messenger is a direct sales and marketing channel not to be overlooked. The live video phenomenon spread right through to December, with Instagram introducing the feature for Instagram Stories just before Christmas. Despite the promo’s emphasis on younger users, the opportunities for marketers are the same for Instagram live video as they are for live video on any platform – time to start getting on board. And finally we have an update worth highlighting from good old LinkedIn. That may sound like a bit of a sneering comment, but in fact I’d like to contend that LinkedIn is what it is (a professional network) and does what it does (connect business people) well, and so too much tampering with its successful tried and trusted formula is perhaps not necessary. But, be that as it may, at the end of 2016 the platform did introduce one worthy new feature of note – Conversation Starters. “At LinkedIn, we’re always working on ways to help you be more productive and successful in your career. One of the key ways we do that is through messaging, since conversations are at the heart of building relationships. “We know that reaching out to reconnect, ask for advice or network for potential job opportunities can be intimidating. How do you start a conversation with someone you haven’t spoken to in months? So, it’s a new year, we all have new aspirations – so why not reach out on LinkedIn and make some new partnerships for 2017? It’s got to be worth a try. That’s all, folks! Your Digital Marketing Weekly Roundups will continue as normal as from next week. Wishing you all the very best for 2017!